This statistic gives outlook figures on major markets for wood pellets between 2010 and 2025. In 2025, North America's demand for wood pellets is expected to amount to around five million metric tons. Wood pellets are a type of heating fuel usually made from compressed sawdust, as well as various other wood manufacture by-products. The pellets are considered an alternative to fossil fuel sources such as coal or natural gas. Europe is expected to remain the most important target market for wood pellets through 2025, as European demand for wood pellets is expected to grow to more than 38 million metric tons by 2025. 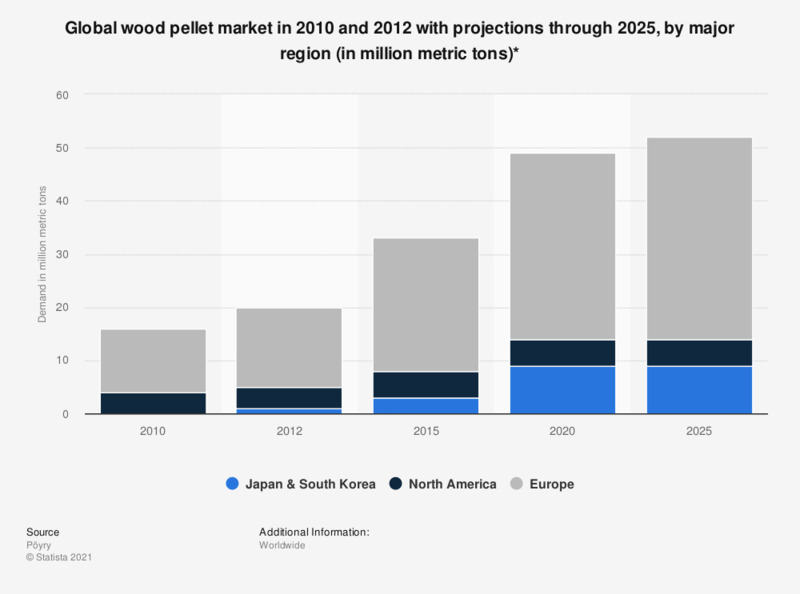 Although Western Europe is ranked among the biggest wood pellet producers worldwide, a large part of this demand is likely to be met by imports, predominantly from the United States and Canada. The North American region is one of the most important wood pellet producers worldwide, and Europe imported more than 8 million metric tons of wood pellets in 2014. As of 2012, the Canadian company Pinnacle had a total production capacity of more than one million metric tons; in 2012, Pinnacle was North America's largest wood pellet manufacturer. Although wood pellets are used as a fuel in Europe’s residential sector, it is the industrial sector that accounts for the greatest part of the market. Energy companies, such as Germany’s RWE, account for a considerable proportion of the total industrial wood pellet consumption. * The figures for 2015 through 2025 are projections. Statistics on "Renewable energy industry worldwide"